With a pen lodged firmly in the back of his mouth and between this teeth, Mateo Vazquez ’21 recited his speech on the lazy consumption of media in the age of the internet to a room in McCook. To any other onlooker, the noises coming out of his mouth would sound like unintelligible gibberish. To the rest of the Speech Team, however, they knew he was just practicing his annunciation, a key part of a speaker’s delivery. This is a typical practice for the team called Pen Drills, and they are a part of a process that includes writing, editing, memorizing, and run-throughs. Vazquez was getting ready for Trinity’s first-ever tournament at Lafayette College, which took place in October of 2018. Vazquez’s piece on the media is one of many speeches that the team has taken to tournaments this past season. Other pieces have discussed topics like the troubling view that motherhood should be a requirement of womanhood, how a transfer of power in Algeria would likely be violent, the healthcare system historically mistreating black patients, and how the Census is shaped by our collective perception of race. These distinct topics are explained through vastly different mediums of speech. For example, extemporaneous speaking is an event that requires a competitor to prepare a seven-minute impromptu speech that answers a political question. Another event called Program of Oral Interpretation is a dramatic performance of poetry, prose, and drama. There are a total of eleven such events offered by the American Forensics Association, the organization that oversees collegiate speech. 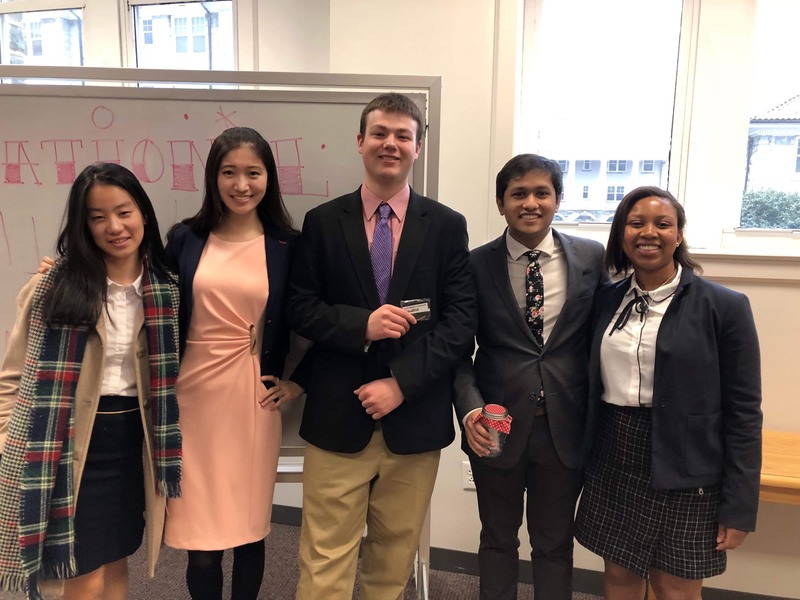 Since October, the Speech Team has competed in many other intercollegiate tournaments including the District tournament at James Madison University this past month. At Districts, the five-member team had a great showing with three students making it to finals and two of which qualifying for Nationals. Though the regular season is over, the Speech Team looks to grow their team next semester and will be holding an informational meeting in the fall of 2019.The road to the Nationals has not been without hardship. The team has had to deal with everything from a broken-down rental car to a judge telling a competitor to “do another event.” Despite these troubles, the team has worked tremendously hard throughout the season by getting feedback from Trinity faculty members and doing multiple run-throughs leading up to tournaments, among other efforts. And every bit helps. On one of his ballots from the Lafayette College tournament, Mateo was told he had “great annunciation!” His gibberish paid off.